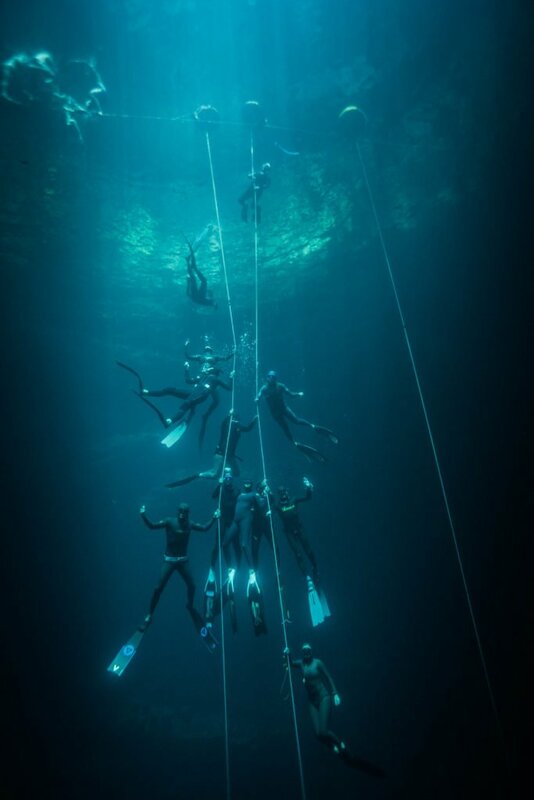 Explore the cenotes of Mexico’s Yucatan peninsula with freediving champions Carlos Coste and Ashley Chapman. Learn their secrets to breath hold diving. During this eight day immersive experience we travel deep into the ancient Mayan world to dive the most beautiful cenotes in the region. This trip is not only designed for the “deep at heart”. We explore both deeper and shallower cenotes for the most complete adventure possible. 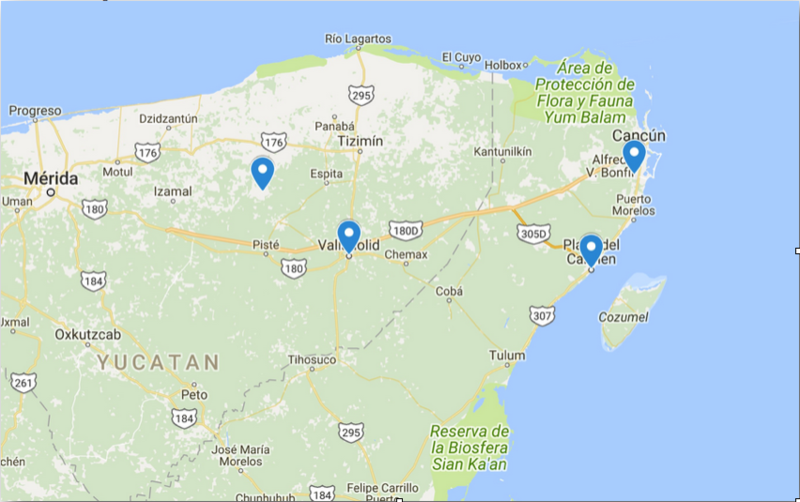 The trip also includes daily yoga, specialty workshops, visits to Mayan ruins, and long bus rides down desolate dirt roads. Travel by private van(s) for duration of the trip. Watch the team as they discover a virgin cenote in the jungle of the Yucatan Peninsula. Map of the cities and villages we will be staying in. Cool to flash back to previous years and see the joy we all experienced. These are people we will always be friends with. Carols is a world class freediver and record holder. He started seriously training for freediving in 1996, and got his first national record in 1998. In October 2003, he became the first human to achieve a Free Immersion of more than 100 meters (-101m, Venezuela 2003), certified by AIDA World Record and Guinness World Records. He also was the first freediver to pass 100 meters in Constant Weight (-102, Cyprus 2004). Coste became the first AIDA Depth Individual World Champion, He won the World Championship making a new World Record in Constant Weight -105m, celebrated in Nice, 2005. He broke the AIDA world record for Variable Weight Free-diving, with a 140-meter immersion in the Red Sea, Egypt, on May 9, 2006. This record was superseded by Herbert Nitsch, on 7 December 2009 at Dean’s Blue Hole in the Bahamas. In 2010, after a long relationship, He got married to his manager Gabriela Contreras. Additionally, Coste has broken several freediving world records, including Constant Weight (-90 meter, October 2002; -102 meter, June 2004; -105 meter, 2005, Variable Weight (-135 meter, October 2004), and Free Immersion (-93 meter, October 2002; -101 meter, October 2003). Not to mention, he’s a great guy and runs Deepsea Freediving School in Bonaire with his wife, Gaby. If you find yourself in earshot of Ashley you will quickly learn that she has several passions; her faith, her family Ren and Ani Chapman, their live aboard sailboat and freediving. Freediving took Ashley by storm in 2008 when she decided to participate in the PFI Intermediate course in the Cayman Islands. The only goal in mind, to reach 100′ she exceeded her expectations by maxing out the course at 132′. Intoxicated by the rush of success in a new sport she went on to complete the PFI Instructor program. She is now an independant PFI Instructor and president of Evolve Freediving, teaching freediving courses in her home port of Wilmington, NC and throughout the Caribbean. Other freediving accomplishments include selection for the 2008 US Women’s Team in the World Freediving Competition, where the US women clenched the silver medal. She succeeded at the Deja Blue 2010 Competition, where again, she came home with a silver medal. At Deja Blue II in 2011 she came home with three national records in the discipline of CNF. The deepest record being set at 58 meters. Ren was born and raised in Wilmington, NC, a quaint, seaside community rich in history and natural resources. From day one he was immersed in coastal living and was fortunate enough to have been raised with his toes in the marsh and estuaries of the area. Ren’s father, biologist and teacher, has been the Scuba instructor as well as the director of water safety for the University of North Carolina at Wilmington since the mid 70s and always had Ren around the ocean. Ren began scuba diving at the age of 6 years and after a short period of inactivity during his college years he got back in the water and has never come out. Ren attended the University of North Carolina at Wilmington where he received an athletic scholarship to play baseball. In the summer of 1997 he spent all summer between thunderstorms obtaining his private single engine pilots license, which is how he scored Ashley. As Carlos’s wife Gaby had found her place in the water beside her husband as a coach, official AIDA competition judge and photographer. Gaby has a PhD in Engineering Science: Biomechanics. She is the Deepsea School Managing Director, a passionate Photographer and Explorer and is “Always inventing”. Pedro hails from Merida and is our West Yucatan guide. 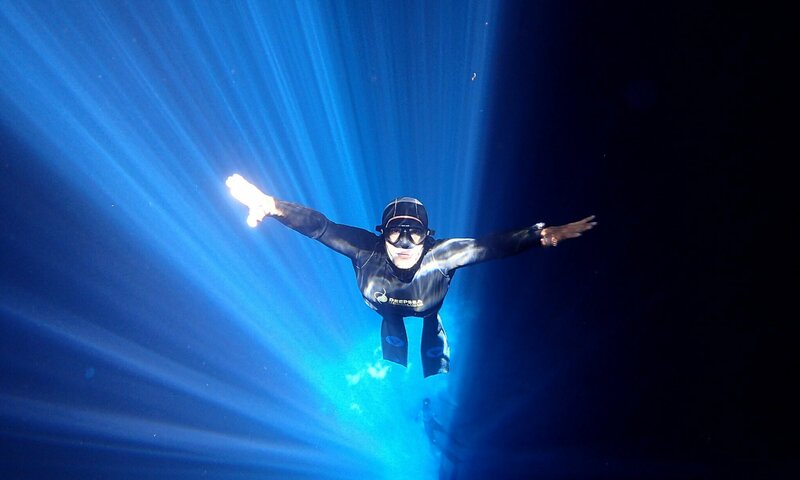 Our Eastern Yucatan guide, Julien is the founder of Pranamaya Freediving and Yoga education. It is a project that started at the beginning of 2013 in collaboration with Aurora Forteza. Julien is originally from France but has been living in Mexico since 2008. Julien discovered his passion for the water at the age of 10 in a swimming school where he was introduced to scuba diving and freediving. Really quickly, Julien understood that the underwater adventure would be his destiny. First as scuba instructor then as freediving instructor, he has been traveling and working around the world since 2001, in countries like France, Egypt, the Maldives, Bahamas and French Polynesia but it was in Mexico, especially the Yucatán peninsula, that Julien found his home.